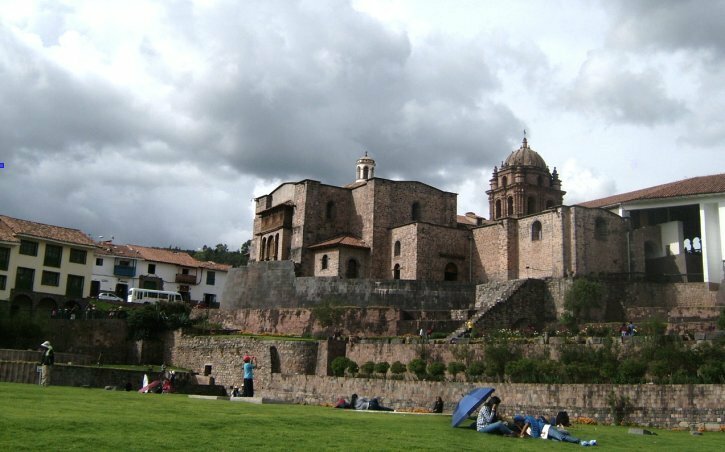 The Convent Church of Santo Domingo de Cusco was built directly on top of the Coricancha (Temple of Gold/Temple of the Sun) shortly after the Spanish conquest of the Incas. This location was a huaca (sacred site) during the ascendancies of many different cultures prior to that of the Incas in Cusco. In the foreground is the garden of the Coricancha, through which a cesque (alignment) runs that crosses several other pre-Inca huacas in Cusco. © Dave Truman. Like all myths, this passage from Pedro Samiento de Gamboa’s History of the Incas is packed with imagery, if not symbolism; not least because the early Incas were a tribe of bird-shamans. My primary concern here, though, is the ancient science of geomancy and its various manifestations in and around the Andean City of Cusco. For those who may not be familiar with the term, geomancy has been practised by peoples around the world from time immemorial. It is a way of setting out both the natural and artificial features of a landscape in accordance with certain geometric and cosmological principles. Cusco is a veritable trove of geomancy and the Incas were geomancers par excellence. Contrary to popular impressions, however, the history of Cusco did not begin with the Incas and neither did its geomancy. The above passage from de Gamboa’s History is worth a closer look, because it is highly revealing. I first came across it in an English version, where the above word I have translated as ‘cairn’ was rendered simply as ‘heap’. A heap of stones is something that is inherently random. If this was simply a ‘heap’ of stones, then the story would be just about a bird (albeit one transformed from a human through shamanism) flying to its summit… so what? De Gamboa did not use the Spanish word for ‘heap’ (monton) in this passage, however. He used a different word: mojón, which has rather significant connotations. I have translated it as ‘cairn’ here because the word implies stones that have been placed into position deliberately, perhaps for a ritual purpose. Interestingly, mojón can also mean a milestone, or boundary marker. It just so happens that the Spanish word mojón embraces two concepts that are the very basis of South American geomancy: the cesque (ceque/seque)3 and the huaca (waka). We will come to learn a lot more about both of these concepts shortly. For the moment, it is worth observing that this was no wilderness into which the Inca family had arrived. It had defined boundaries and territory that had been measured. Above all it possessed a sacred place, or cairn. The location in question, the Convent Church of St Domingo, stands at the centre of Cusco even today. It was built on the site of the great Inca Temple of the Coricancha (Temple of Gold, but perhaps better known as the Temple of the Sun), which itself was constructed over places of ritual (huacas) belonging to several earlier cultures.4 5 Manco Cápac’s brother, Ayur Auca, may have been making a political statement by flying to the top of the boundary stone, as much as he was undergoing a shamanistic transformation from man to bird. In the ancient Andes, we would be very much mistaken if we were to separate the sacred from the profane as we are wont to do in the modern world. 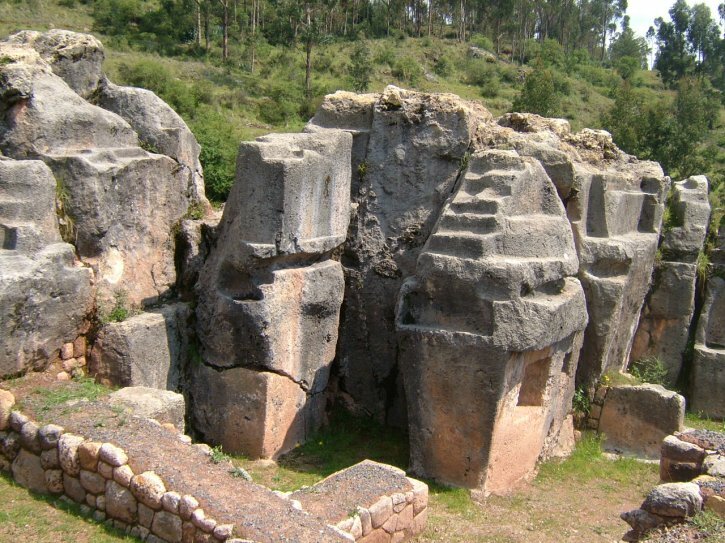 Inkilltambo, set in a high valley above Cusco, is an exquisite example of a huaca that has been formed from limestone. Notice the ‘steps’ that have been shaped from the living rock. This is a common feature of these huacas, which occur all along the Way of Wiracocha, from Copacabana in Boliviia to Cajamarca in northern Peru. © Dave Truman. Modern western culture is geared towards appreciating the material and the tangible. More often than not, we describe objects around us in terms of their physical properties and appearances. Huacas are not like that, which is largely why the concept of the huaca is so elusive to people versed in the western way of thinking. In other words, a huaca is not a particular ‘thing’; instead, it may be a stone, a statue, a river, or even a mountain peak. What distinguishes a huaca from the rest of the surrounding landscape is that it serves as the focus for a ritual activity of some sort. For ancient – and indeed modern – indigenous Andeans this implies not only that the Earth is a living entity (Pachamama), but that certain locations are endowed with particular qualities worthy of reverence (genus loci).6 It may be easy for us to assume that the choice of a specific place, or huaca, for ritual activity is an arbitrary matter, but this is far from the case. In the Andes of long ago, there was perhaps an even greater understanding of the cosmic and geomantic principles that governed the positioning of huacas than there is today. My guide, Aldair Choque , negotiates some ‘steps’ on the slope of another of Cusco’s huacas: Amaru Markawasi. What purpose did these ‘steps’ serve? They are too large to help humans ascend to the summit, and actually hinder the process. At other huacas, the ‘steps’ are far too small to serve that purpose. © Dave Truman. One thing is for sure, the origins of huacas are extremely ancient. On Peru’s northern coast, Huaca Prieta has recently been dated by archaeologists to 13,720 years BP – a time when ground sloths and sabre toothed cats still roamed South America.7 The wooded valleys and high points that surround Cusco are replete with huacas, most of which are ignored by Cusco’s burgeoning tourist industry today. 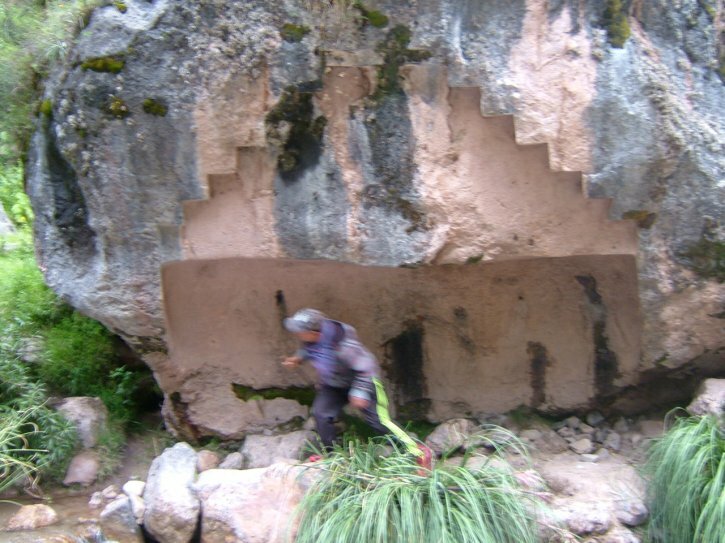 Until recently, they have been considered as little more than Inca shrines, but there is an increasing realisation amongst archaeologists that many date from before the arrival of the Incas here. The real question is, how long before? How old are Cusco’s huacas hewn from living rock? This rock formation, adjacent to the stepped huaca commonly known as the Throne of the Inca at Sacsaywayaman, provides clear evidence of sustained glacial erosion. © Dave Truman. At least some native Peruvians who have studied these places of ritual are in little doubt that they were created many thousands of years before the coming of the Incas. Shaman and researcher Carlos Fernández-Baca Tupayachi considers that the huacas were formed by demigods known to the indigenous people of the Cusco region as the Ñaupaq Machula, or ‘Wise Old Ones’. As the illustrations show, many huacas are fashioned into ‘steps’, ‘seats’ and other regular shapes from outcrops of living stone. 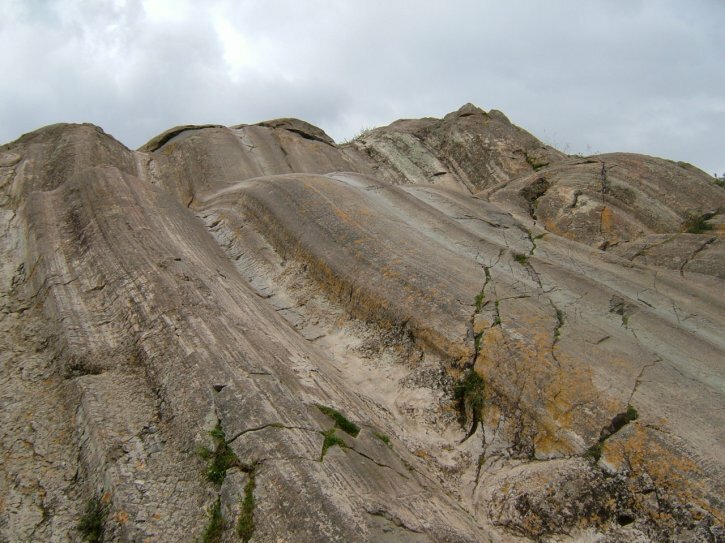 Fernández-Baca Tupayachi has observed that the worked surfaces of the huacas often exhibit signs of considerable erosion. In some cases, there is even evidence that some of this has been caused by glaciers.8 That would place the origins of Cusco’s huacas back in the Pleistocene; a prospect that is not so far-fetched given that Huaca Prieta is now firmly established as being around 11,700 years old. The many years of diligent study of the megaliths in and around Cusco by the father and son Alfredo and Jesús Gamarra have led them to conclude that these rocks, worked from living outcrops, are amongst the very oldest human artefacts on the planet, belonging to an era they have named Hanan Pacha.9 Both Fernández-Baca Tupayachi’s and Alfredo Gamarra’s investigations have been informed by indigenous legends and by their own dreams as much as they have by their assiduous examinations of physical evidence. This seems entirely appropriate, given that the impalpable features so prominently in understanding the true nature of Cusco’s huacas. Complex curved geometries are characteristic of some of the stonework at the huaca of Q’enq’o Chico set above Cusco. Were these just idle decorations, or were they used to engineer vortices in the flowing of the mountain streams running down into the city? © Dave Truman. This great Andean city is set in a deep valley that today is surrounded by steep eucalyptus-clad hillsides. 10 The eucalyptus trees conceal webs of tributary streams that flow down from the highlands to come together in Cusco’s centre, like a feathered headdress.11 At least two detailed surveys of Cusco’s cesques and huacas12 have tried to map their geomantic features within the city’s landscape. Both of them found that some huacas were ‘positioned where water flow changed direction’ (my italics).13 Just about all of the many limestone huacas that I have investigated in the hills surrounding Cusco either straddle, or sit next to, the mountain brooks that wend their diverse ways into the heart of the city. The more I have studied these huacas, the more I have become convinced that those who fashioned the outcrops of living rock deliberately engineered changes in the water flowing through or past them. That engineering certainly involved making changes in the directions of various streams, but it also seemed to have altered the dynamics of the water’s flow as well. A careful examination of the lower parts of some of these large stones reveals that they have been worked so as to affect the flow of the stream itself, below the waterline. Even today, when water levels are generally lower, it is possible to see how some of the artificial stone surfaces create vortices in the water that flows past them. A friend examines an immense boulder, which forms part of a huaca called Quespehuara, which straddles the river Saphi. Was this huaca created when the level of water flowing in the Saphi was much higher than today? If so, was where my friend is standing once beneath the river’s surface? Notice the half-chakana (Andean stepped cross) above his head. Did this once form a complete chakana through its reflection on the stream’s surface? © Dave Truman. Just one of the natural limestone outcrops that has been artificially shaped at Jardin del Inca (The Inca’s Garden). Today, this location is a small park, but were these rocks once surrounded by the waters of the stream that still flows through the huaca? © Dave Truman. 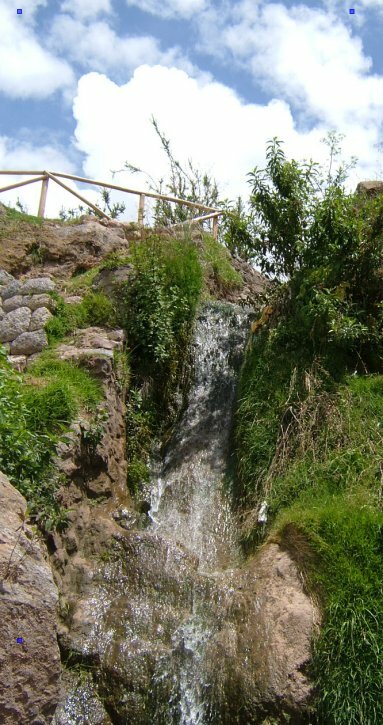 A waterfall at Jardin del Inca. After leaving the huaca, the stream enters an underground channel that takes it to the centre of the city. Notice the lush vegetation that surrounds the waterfall. This is almost certainly the stream mentioned by Inca Garcilaso de la Vega in his Royal Commentaries of the Incas. © Dave Truman. The animal-shaped geoglyph of the spider marked out on the desert pampa at Nazca, which has been proven to correspond to the constellation of Orion. (Note how the linear cesque markings appear to be over the top of the spider’s outline). Most South American animal-shaped geoglyphs and mounds, however, correspond to zoomorphic ‘dark cloud’ constellations that are found within the Milky Way. © Diego Delso, CC BY-SA 4.0. 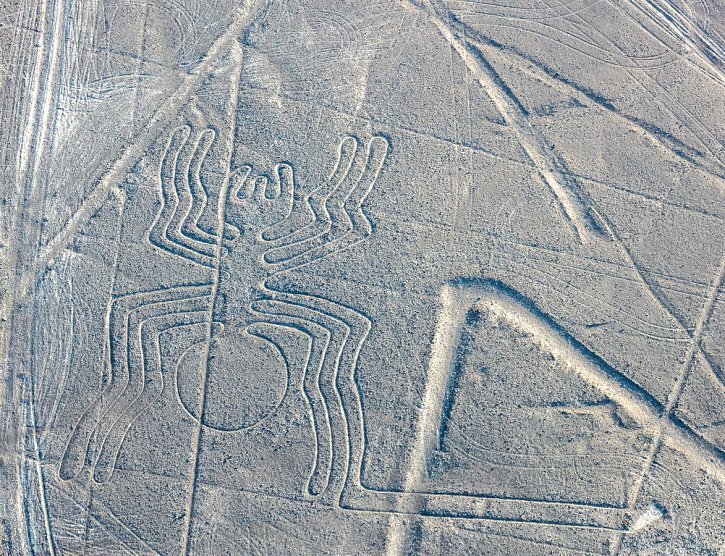 Whilst for the ancient Nazcans a vast spider scratched onto the desert may have corresponded to the constellation we know as Orion,23 24 this is probably not typical of most South American geoglyphs and animal-shaped mounds. More common by far are those built to correspond to zoomorphic ‘dark cloud’ constellations25 that lie within the great celestial river that we call the Milky Way. The pioneering work of Dr Robert Benfer has shown that such mounds and geoglyphs have been constructed here since at least 4,200 BP.26 Quite curiously, it is this most antiquated manifestation of South American geomancy that is at the very centrepiece of the Incas’ radical redesign of the City of Cusco. First, however, we need to understand some of the complexities behind Cusco’s linear cesques. Artist’s impression of the pattern of Incan cesques radiating from the Coricancha in Cusco set within the four composite suyos (‘parts’) of the Tawantinsuyo (‘Four Parts Together’). In fact, nobody really knows the actual number of cesques, or if they all consisted of straight lines, even. In this diagram, the orientation of Cusco’s puma, marked in black, is almost certainly incorrect (see below). Source: Pachakutec Museum, Cusco. Photo: © Dave Truman. 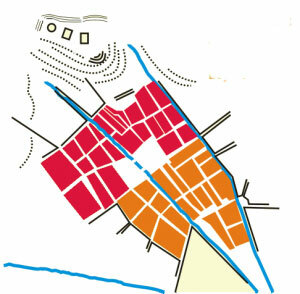 Geomantic map of Cusco, showing its division into Hanan Cusco (marked in red) and Urin Cusco (marked in orange). The white space in the centre is the city’s pre-Hispanic plaza, known as the Aukaypata. (Graphic: Scarton/Municipalidad distrital de Cuzco, CC BY-SA 3.0). 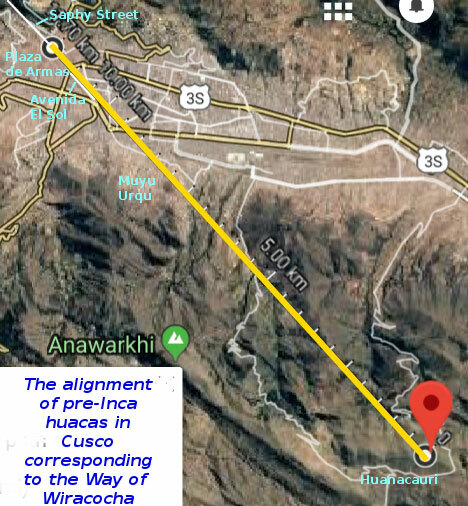 Preliminary plotting of the alignment between the Aukaypata and Huanacari, which runs 45°NW-SE and crosses directly through several huacas that pre-date the Incas. Details above. [Figures 10.1 – 10.5 inclusive]. © Google Maps. It is quite likely that the Incas used Capac Raymi as a piece of social engineering to create a sense of cohesiveness between themselves and the city’s indigenous inhabitants. 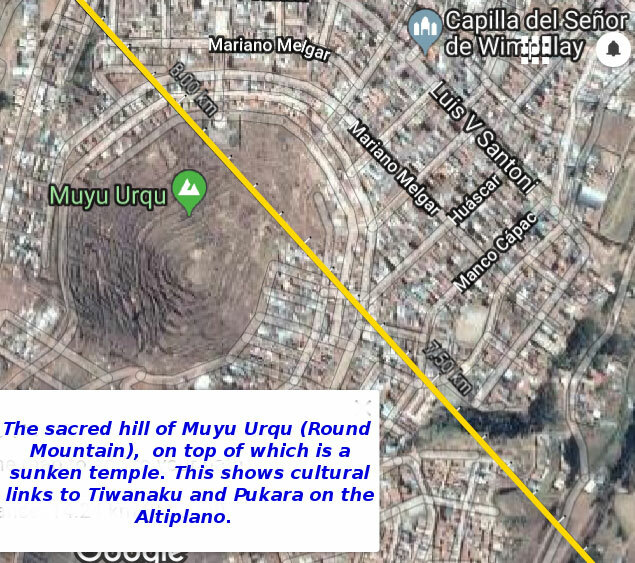 Hence, the processional route was designed to pass through, and eventually culminate at, the huacas originating in previous epochs.38 One such was Muyu Urqu39 (‘the Round Mountain’), which also sits on the alignment between the city’s Plaza and Huanacari. 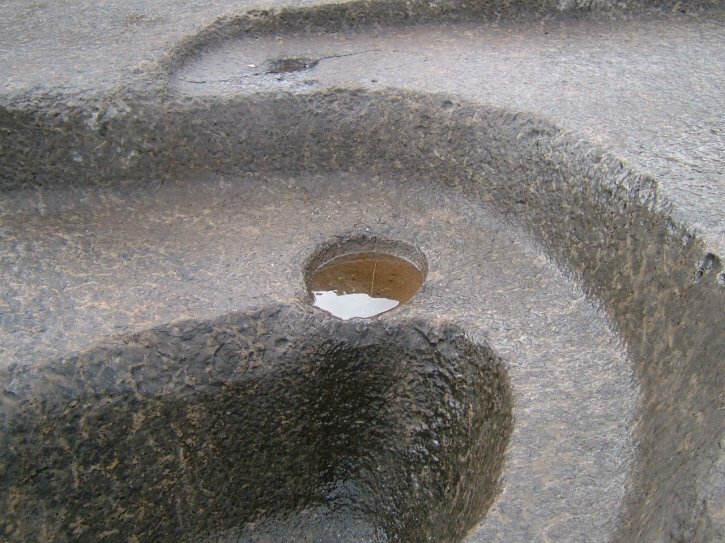 These places of ritual are perhaps amongst the most ancient of Cusco’s huacas. That they are positioned along a cesque that runs for 1,500 miles from northern Peru to southern Bolivia is cause enough for wonder; that the same alignment also mirrors the course of the Milky Way above the Andes is an astronomical phenomenon that verges on baffling human comprehension. The Dark Rift of the Milky Way, showing the Galactic Centre at its zenith. 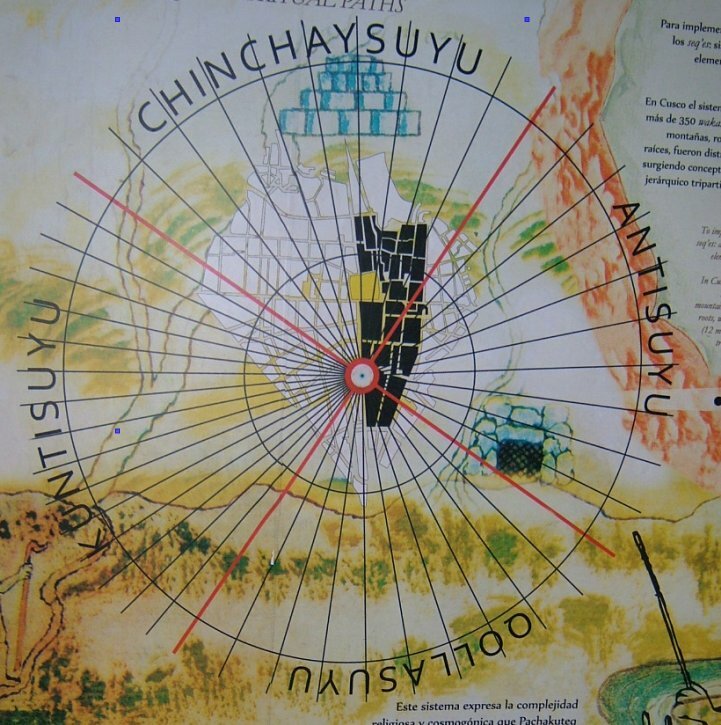 The dark cloud constellation of Choqquechinchay is located between our constellations of Saggitarius and Scorpio. Did the Inca Pachakutec possess an understanding of the structure of our galaxy, the Milky Way? If so, did they inherit an ancient and long-lost science? (Photo: ESO/S. Guisard CC BY 4.0). Two of Pachakutec’s many memorable feats were inextricably bound to each other. He set about his grand design for Cusco43 only once he had conquered and subjugated the Kolla peoples of the Titikaka Basin – the very lands of which Tiwanaku had been the political and geomantic centre for millennia. 44 After Pachakutec’s great victory over the Kollas, Lake Titikaka and the Altiplano (present-day southern Peru and Bolivia) became the Collasuyu; one of the four constituent parts of the Tawantinsuyo that were now subject to Inca hegemony.45 Yet there is much more to this story than the gaining of territory through military prowess and its celebration through vainglorious urban planning. I stated previously that the early Incas were bird-shamans. Interestingly, legends of the sunken cities beneath Titikaka do speak of a tribe who dressed in bird feathers and who went by the name of Pakajes.48 They were involved in a sustained conflict with another tribe living in the Titikaka region known as the Lupaq’as,49 considered by some to have been ancestral to the Kollas.50 Most intriguingly, while the tribal totem of the bird-shaman Pakajes was the condor, that of the Lupaq’as was the puma.51 Stone carvings at Tiwanaku consist of many birds, serpents and pumas. Most archaeologists agree though that the puma – and especially the transformational chachapuma (‘man-puma’) statues there – were used predominantly to represent the psychic changes necessary for journeys into the spirit-world by Tiwanaku’s shamans. 52 But to where, exactly, were these cat-shamans embarking? 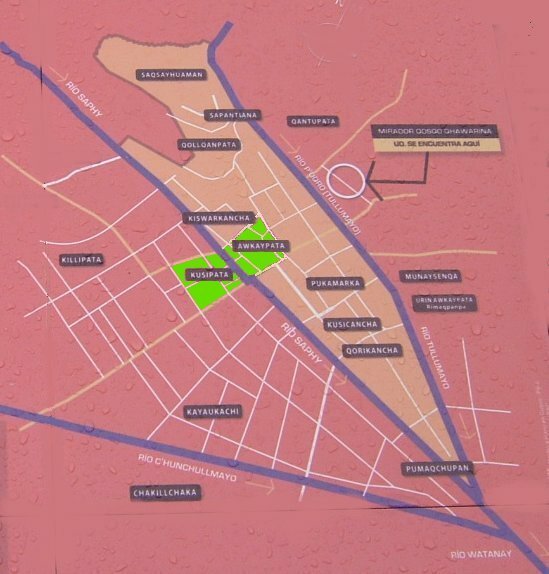 Pachakutec’s geomantic plan for Cusco in the form of a puma realised. Notice the baseline of the puma is a straight line running along a 45° NW-SE axis that cuts directly across the Aukaypata (marked in green). This line is also the course of the River Saphi, which the Incas diverted to conform to this axis. (Source: Municipalidad de Cusco. Photo: © Dave Truman). Far from being a mere expression of a crude triumphalism to celebrate his victory over the Kollas, Pachakutec’s construction of Cusco’s great Puma Geoglyph served several exact and supremely important cosmological, shamanistic and geomantic functions. We must remember here that venerable Andean tradition of building animal-shaped mounds to correspond with dark-cloud constellations that lie within the Milky Way. Pachakutec was a consummate scholar of these traditions and he knew that one constellation in particular was, quite literally, central to the work of Tiwanaku’s shamans. It was called Choqquechinchay and its form was that of a celestial puma.53 This could simply have been an expression of Pachakutec’s triumph over the Incas’ ancestral enemies were it not for the precise location of Choqquechinchay within the Milky Way’s Dark Rift.54 When viewed from the Earth, Choqquechinchay stands in between the constellations Sagittarius and Scorpio. 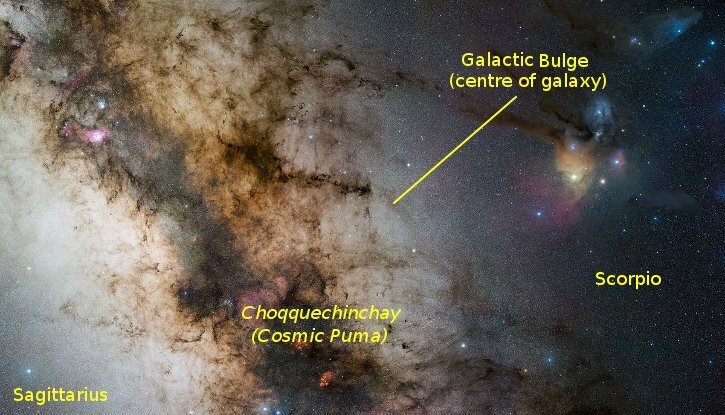 In other words, Choqquechinchay – the Celestial Puma – points directly to the Centre of our Galaxy. This was the trajectory, if not the destination, of Tiwanaku’s shamans on their extra-physical journeys. It was what ultimately justified the city’s right to become such a great geomantic centre. Through his conquest of the lands of Tiwanaku, Pachakutec was asserting Cusco’s absolute right to be the Navel of the World.55 He could not have done so had Cusco not, like Tiwanaku, stood directly beneath the Galactic Centre at its zenith during the month of December. It is testimony to the breadth and sophistication of this most archaic Andean science that the concept of the Navel of the World embraced an understanding of the celestial geometry of the Milky Way. It is the great tragedy of our era that, with the coming of the Spanish, this last repository of a sophisticated and precise knowledge almost became lost forever. 1 “Desde el cual asiento Manco Capac vio un mojón de piedra que estaba cerca del sitio donde ahora está el monasterio de Santo Domingo del Cuzco, y mostrándosele a su hermano Ayar Auca, le dijo: “¡Hermano! ¿Ya te acuerdas cómo está entre nosotros concertado que tú vayas a tomar posesión de la tierra donde hemos de poblar? ¡Y pues ahora, mira aquella piedra!” Y mostrábale el mojón dicho: “¡Ve allá volando (porque dicen le habían nacido unas alas), y sentándote allí toma posesión en el mismo asiento donde aparece aquel mojón, porque nosotros iremos luego a poblar y vivir!” Historia de los Incas, p. 101. 2 De Gamboa, Pedro Historia de los Incas, p. 101. 3 Goncalez Holguin’s seventeenth century Quechua-Spanish dictionary defines the Quechua word ceqque as línea término, or ‘boundary line’ (Pathways to the Gods, p. 88), which is also synonymous with de Gamboa’s mojón in this context. 4 Goycochea Olazo, Diego, Repositorio Académico, Universidad Peruana de Ciencias Aplicadas, 2018, p. 39. 5 Usvat, Liliana, ‘Coricancea: The City of Gold, Peru‘ on YouTube (9th December, 2016). 6 Animism, which is essentially what this is, was often dismissed as ‘primitive’ and even ‘superstitious’ by European colonisers, who themselves were ignorant of the fact that the fathers of European philosophy, Plato and Pythagoras held that the universe was a living being. See Sarah Ann Lawless’ excellent discussion of the topic. 7 Wade, Lizzie, ‘Traces of some of South America’s earliest people found underneath ancient dirt pyramid’ in Science (May 24th 2017) and Dillehay, Tom et al, ‘Chronology, mound-building and environment at Huaca Prieta, coastal Peru, from 13700 to 4000 years ago’ in Antiquity Vol 86, pp. 48-70 (2012). 8 Fernandez-Baca Tupayachi, Carlos, Saqsaywaman: A Model of Atlantis, the Untold Story, Munaypacha, Lima, 2006, p. 161. 9 Gamarra, Alfredo and Jesús,‘The Discoveries of Alfredo Gamarra’ on Ancient Mysteries Explained. 10 The eucalyptus trees were planted by the Spanish, but they continue to be a valuable source of timber and firewood for the people of Cusco. 11 The rivers that converge in the centre of Cusco are: Riachuelo, Choquechaka, Saphy/Tullumayu,Qorimachaqwayinyoq, Wankaro and Watanay. Source: the Pachakutec Museum, Cusco. 12 Paul Devereux refers to work conducted separately by Zuidema and Aveni. 13 Devereux, Paul, Shamanism and the Mystery Lines, Quantum, Slough, Bucks, 2001, p81, citing, Zuidema, R. Tom , The Ceque System of Cuzco. The Social Organization of the Capital of the Inca, E.J. Brill, Leiden, 1964. Aveni, Anthony, Horizon Astronomy in Incaic Cuzco in Archaeoastronomy in the Americas, (ed. R. Williamson), Los Altos, CA: Ballena Press, 1982, pp. 305-318. 14 Inca Garcilaso de la Vega, Comentarios Reales de los Incas, Ediciones La Republica, Tomo XXIII, Montevideo, 1992, pp. 2185-2186. 15 The controversy centred on the rival claims in the early 2000s of the Bolivian archaeologist Marcos Michel and US archaeologists Clark Erickson and Alexei Vranich from Pennsylvania University (known as the Tierra Sajama Project) as to who first ‘discovered’ the Sajama Lines. In addition, the Bolivian’s view was that the Lines were no older than the colonial period, whereas the US archaeologists sought to establish the date(s) when the Lines were made, in their plans for the subsequent phase of research. They also wished to examine the possible astronomical correlations of the Sajama Lines. Even if, however, Marcos Michel was correct that the Lines were no older than the colonial period, they undoubtedly resulted from ritual and spiritual practices that were far older. Today, the consensus view is that they date to around 3,000 years. In fact, neither of the two parties actually ‘discovered’ the Sajama Lines, since there is evidence that they were used by indigenous people until very recently. Also, the Lines had been identified by European travellers by as early as the 1930s. Writing in the 1970s, Tony Morrison tells of his flying over the Lines as well as of making a visit there. He was struck by the accumulation of sand dunes over some of the Lines, which suggested to him that they were of great antiquity. (See: Pathways to the Gods, p. 159). 16 Morrison, Tony, Pathways to the Gods: The Mystery Lines of the Andes, Michael Russell Publishing, Salisbury, 1978, pp. 159-160. 17 Please refer to footnote 44, on the meanings of the Aymara word mallku. 18 Encinas Montaño, Oscar, Corrales Pereryra, Dante, Descifrando el Enigma de los Símbolos de Oruro, Latinas Editores, Oruro, Bolivia, 2006, p. 100. 19 In recent years, surveys using drones have identified more Nazca Lines than were thought to have existed previously. See for example Greshko, Michael, ‘Exclusive: Massive Ancient Drawings found in Peruvian Desert’ on National Geographic (April 5th 2018). 20 Hancock, Graham, Fingerprints of the Gods: Evidence of Earth’s Lost Civilization, Heinemann, London, 1995, p. 38. 21 Reiche, Maria, Mystery on the Desert, Ministry of Education of Peru, Lima, 2001, pp78-82. Also see presentation made to the author at in the Planetario Maria Reiche, Nazca, Peru and the Maria Reich Planetary. 23 Fingerprints of the Gods, p. 39. See also Hancock, Graham, Faiia, Santha, Heaven’s Mirror: Quest for the Lost Civilization, Michael Joseph Ltd, London, 1998, pp. 262-263. 24 Dr Phillis Pitluga of the Adler Planetarium in Chicago identified the Nazca spider geoglyph with the constellation we know as Orion. The species of spider is a member of the genus Ricinulei, found thousands of miles away in the Amazon basin (see: Fingerprints of the Gods, pp. 39, 509). 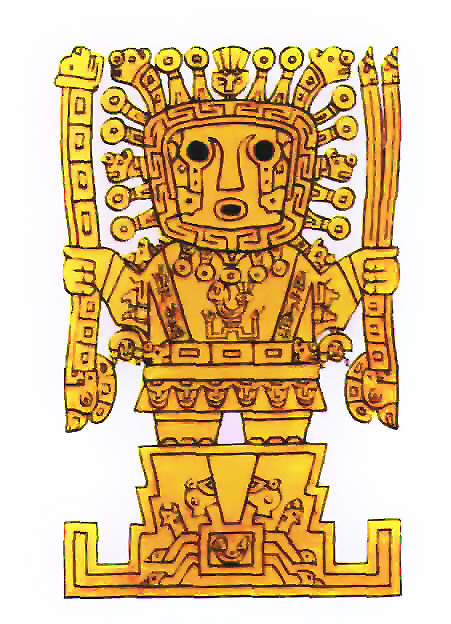 For the Incas and earlier Andean cultures, the three stars that form the ‘belt’ of Orion were known as the ‘ladder’ (chakana) (see The Secret of the Incas, pp. 69-70). At these latitudes, Orion appears to be on its side when compared to its being seen from a northern latitude, such as Britain. Hence, the three stars appear to be almost vertical. The association with the ladder not only stems from fact that the ‘belt’ is seen as vertical here, but it also may relate to the three vertical spatial pachas (worlds) of the Andean cosmos. 25 Ancient Andeans did not use our familiar zodiac of twelve “bright” constellations circling the Earth in what is called the plane of the ecliptic for their star gazing. Instead, their main focus of attention was the Milky Way as it traversed the heavens. Although certain “bright” constellations were important to them, their zodiac consisted of various “dark clouds”, or dark constellations, within the band of the Milky Way, to which they ascribed the names of animals: the llama, the fox, the toad, serpent, partridge etc. Known collectively as the Dark Rift of the Milky Way, astronomers will tell you that the dark constellations consist of a series of overlapping, non-luminous, molecular dust clouds that stretch for approximately one third of the Milky Way’s length. 26 University of Missouri, Columbia, ‘Rare animal-shaped mounds discovered in Peru’ on Phys.org (March 29th 2012). 28 Pathways to the Gods, p. 89, citing: Cobo, Bernabé, Historia del Nuevo Mundo, 1653, In BIBL. AUT. ESP. Tomi XCI, XCII, Madrid, 1956. 29 Contrary to what we are told, the principle of heliocentricity (that the sun is at the centre of our planetary system) was only really rediscovered, rather than discovered, during the European Renaissance. There is evidence that both Pythagoras and the Sumerians understood this principle. 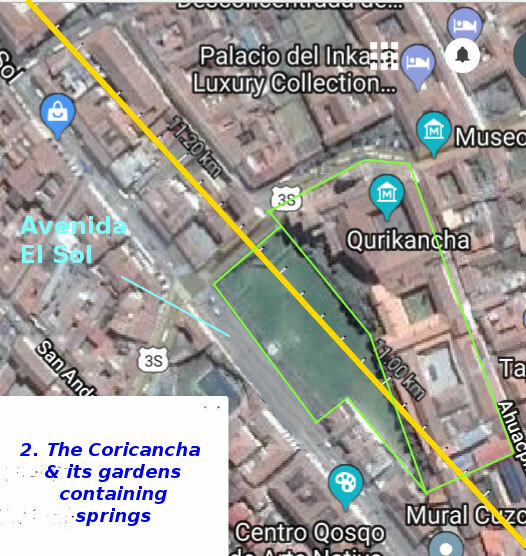 As far as South America is concerned, I take the Incas’ placing of the Coricancha (Temple of the Sun) at the centre of Cusco’s system of cesques as strong inferential evidence of their understanding heliocentrism. The City’s geomancy was, after all, conceived as a reflection of a celestial reality. 30 Shamanism and the Mystery Lines, p. 81. 31 For reasons of brevity, I have simplified the some of the complexities of how the Incas generated Cusco’s cesques. The reality was that members of each ethnic group (ayllu) were ‘star guardians’ of particular celestial animals (dark cloud constellations) and bright stars. 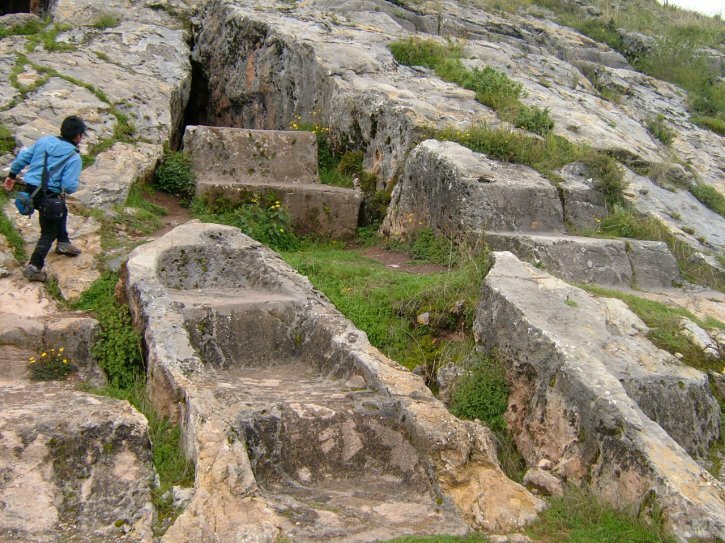 Their ritual observances at the huacas, positioned along the cesques were meant to maintain the sanctity and integrity of the heavens. Sometimes the positioning of the cesques (as boundaries) related to the geographic origins of the tribe in question within the Tawantinsuyo. Sometimes it related to the celestial position of the heavenly body in question. Obviously, it was not always possible for these two factors to coincide. The star guardian system has very ancient roots in the Pleistocene (Ice Age). See: The Secret of the Incas, pp. 238-241 and pp. 366-368. 32 Comentarios Reales de los Incas, p. 2141. 33 Lajo, Javier, Qhapac Ñan, La Ruta Inka de Sabiduría, Edición Amaro Runa-CENES, Lima, 2005, p. 84. 34 Sullivan, William, The Secret of the Incas, Crown Publishers, New York, 1996, p. 70. 35 See footnote 44 below, on the likely pre-Inca – or pre-Pachakutec – origins of the name Aukaypata. 37 The position of the Milky Way in the heavens is not static. It varies according to the time of year. Over the Andes in December – the month of the Summer Solstice in the Southern Hemisphere – its position is 45° NW-SE. 38 Kosiba, Steve, Tracing the Inca Past: Ritual Movement and Social Memory in the Inca Imperial Capital, 2015, p. 187. 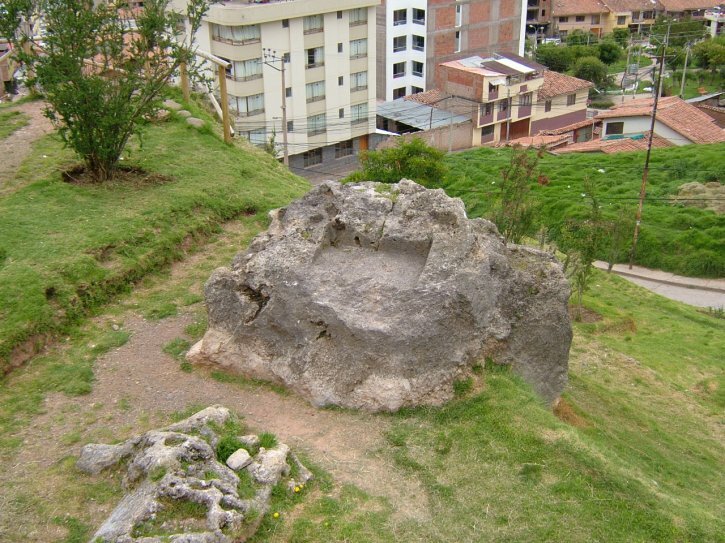 39 Zapato Rodriguez, Julinho, Los Cerros Sagrados: Panorama del Periodo Formativo en la Cuenca del Vilcanota, Cuzco, Boletin de Arqueologia. pvep, W 2, 1998, pp. 307-336. 40 Major Jenkins, John, Galactic Alignment: The Transformation of Consciousness According to Mayan, Egyptian, and Vedic Traditions, Bear and Company, Rochester Vermont, 2002, pp. 206-7. Specifically, Major Jenkins noted that Tiwanaku, at 16° South of the Equator, passes directly underneath the Galactic Centre at its zenith. Cusco, lying exactly to the North-West of Tiwanaku, also passes beneath the Galactic Centre. 41 The Tawantinsuyo is commonly referred to as the ‘Inca Empire’ even by professional historians, but it was never really an empire in the sense that European countries possessed empires. 42 Elorrieta Salazar, Fernando E, Elorrieta Salazar, Edgar, Cusco y el Valle Sagrado de los Incas, Alkamari E.I.R.L, Cusco, 2004, p. 35. 43 Saqsaywaman, a Model of Atlantis, pp. 66-68. See also ‘la refundación integral’ on ciudad inca del Cusco. 44 That Pachakutec redesigned Cusco to conform to his grand design, rather than building the city from scratch, is of prime concern here. It may explain, for instance, why the head of Cusco’s great Feline Geoglyph – Sacsayhuayaman – posesses an anomalous name, since it translates into English as ‘Place of the Sated, or Speckled, Hawk’, rather than Puma Uma or ‘Puma’s Head’. (See Saqsaywaman a Model of Atlantis, p. 68). It could also clarify why, according to Garcilaso de la Vega, Pachakutec seemed unaware of any proven techniques used to transport the megaliths used in Sacsayhuayaman’s construction, causing the deaths of 3,000 men when he tried to do so. (Fingerprints of the Gods, pp. 50-51 & Heaven’s Mirror, pp. 286-287). 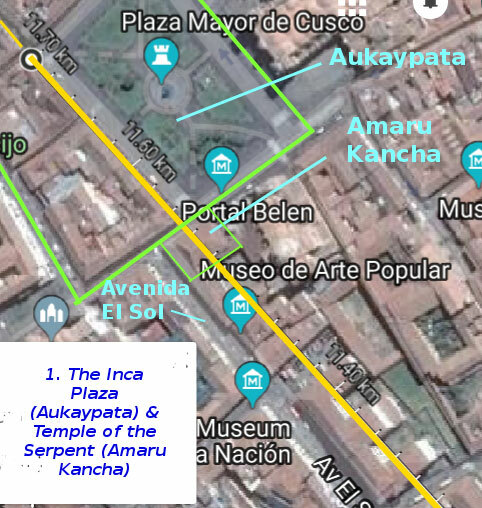 Tellingly, it also would account for why Cusco’s main Plaza, which corresponds to the location of the Puma’s heart on the Cusco Geoglyph, is called in Quechua Aucaypata, rather than Puma Sunqu (‘Puma Heart’). Equally, those Cusco names that do correspond to specific parts of the Puma’s anatomy, and which do include the word ‘puma’, relate to districts rather than to specific buildings, or plazas: Pumakurku (‘Puma’s Back’) and Pumamaqchurpan (‘Puma’s Tail’). This suggests perhaps that they were named as part of Pachakutec’s great geomantic plan. (See Saqsaywaman, a Model of Atlantis, p. 67). 45 Davies, Nigel, The Ancient Kingdoms of Peru, Penguin, London, 1997, pp. 123-124. 46 See for instance: Cristóbal de Molina – Narrative of the Rites and the Laws of the Incas, Inca Garcilaso de la Vega – Royal Commentaries of the Incas, Pedro Sarmiento de Gamboa – History of the Incas, Bernabé Cobo – History of the New World. 47 Shinoda K, Adachi N, Gullen S, Shimada L, ‘Mitrochondrial DNA analysis of ancient Peruvian highlanders’ in American Journal of Physical Anthropology Vol 131, Issue 1, pp. 98-107 (September 2006). 48 Simone Waisbard calls these bird-shamans Pakajes, but that name may be from the Spanish pajaro (bird). Others, such as Calque Romero, refer to them as the Mallku Condoris (the Condor Lords). In modern-day Quechua, mallku simply means young condor, but in the Aymara language the term Mallku Kuntura (Lord of the great heights) is redolent of a number of metaphysical functions. Not least of these is that of an intermediary between humans and the Apus (Andean tutelary deities, often residing in mountain summits), who interpret the significance of the spiritual forces behind natural phenomena to humans. (Also, in Aymara Mallku means the same as Apu in Quechua). This is, quite evidently, one of the principal functions of a shaman. Interestingly, the duties of Mallku Kuntura also involve political, social and territorial matters. It is worth considering the story of Ayar Auca given at the start of this article in the light of this information. 49 Waisbard, Simone, Tiahuanaco, Diez Mil Años de Enigmas Incas, Edición Diana, Ciudad de Mexico, 1987, pp. 59-60. 50 Ramiro Colque Romero, Ernesto, Lago Titiquaqua Maravilla Andina, Editorial Altiplano, Puno, 2010, p. 116. 51 Lago Titiquaqua Maravilla Andina, p. 115. 52 Information gained from the author’s visit to the Lithic Museum, Tiwanaku on 30/12/’17. 53 The Secret of the Incas, p. 139. 54 Interestingly, in Mesoamerica the Milky Way’s Dark Rift was associated with the mouth of the jaguar and was similarly seen as a conduit for extra-physical journeys by shamans, who were considered as were-jaguars (half-man half-cat). See: John Major Jenkins, Mayan Cosmogenesis, p. 186. 55 Cusco (Q’osq’o in Quechua) means ‘Navel of the World’. Anyone notice the baseline of the puma runs to Teotihuacan? i.e. the Puma is facing Teotihuacan? I don’t have access to Google Earth at the moment, so I can’t check with any precision. I’ve just plotted the Teotihuacan-Cusco alignment on a small scale using Marble. It’s positioned about a hundred miles due east of Cajamarca, which stands on the 45 degree axis rediscovered by Sholten D’Ebneth. When I’ve taken compass bearings on the streets that make up the Puma’s baseline, they all run along a 45 degree NW-SE axis that eventually leads to Cajamarca. The Teotihuacan alignment is very interesting, though. I’m looking forward to exploring it further using Google Earth. Thanks. Hello, It is interesting that you claim on here that the archaeologist Steve Kosiba does not consider Huanacauri to have been a huaca prior to the Incas. I am Steve Kosiba. I have never written something like this. I am aware that the Spanish sources recorded Andean narratives about how one of the first Incas joined his flesh to a preexisting place (a “bulto” of a person). I have always published that this is the case. Please change the error in your information, here. 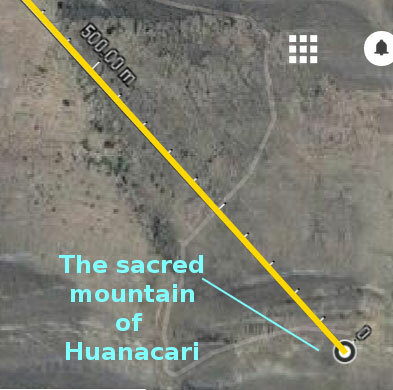 My research only shows that there was not a temple (a set of built structures) on Huanacauri before the Inca imperial period (circa 1400-1450 CE).